The C&O Canal 100 mile race takes places on the scenic C&O Canal each year during the final weekend in April. The race starts and finished at Camp Manidokan near Knoxville, Maryland and will consists of one 60 mile loop and one 40 mile loop. 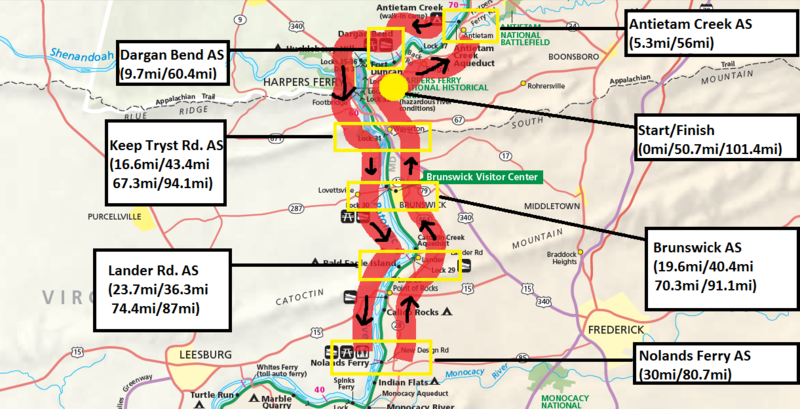 The C&O Canal 100 course is almost entirely flat and offers plenty of opportunities for new 100 mile runners and old veterans who are up for a challenge on a beautiful course. There will be approximately 7 aid stations placed throughout each loop, some of which you will encounter multiple times. The distances between aid stations range from 3-6.9 miles. See the website for a more detailed course description and the official course map. The 2019 race will be held on April 27-28, 2019, starting at 7AM on April 27th, 2019. Registration will open on December 16th, 2018 at 7AM EST. "This is a first class event! Whether you are a first timer or seasoned ultra runner you cannot be disappointed." "Each and every aid station was amazing starting with the wonderfully encouraging and helpful volunteers. The selection of food and drinks was incredible. I’ve never been to a race with aid stations quite like the ones at this race." "The volunteers were exceptional, friendly, helpful, and cheerful." "Extremely well organized race with great volunteers."